As you very well may know, chokers were big during the Summer and have become a festival wear must-have (along with fringe and cool bohemian hats). Personally, I’m more excited about wearing chokers during the Fall. Why? You ask. 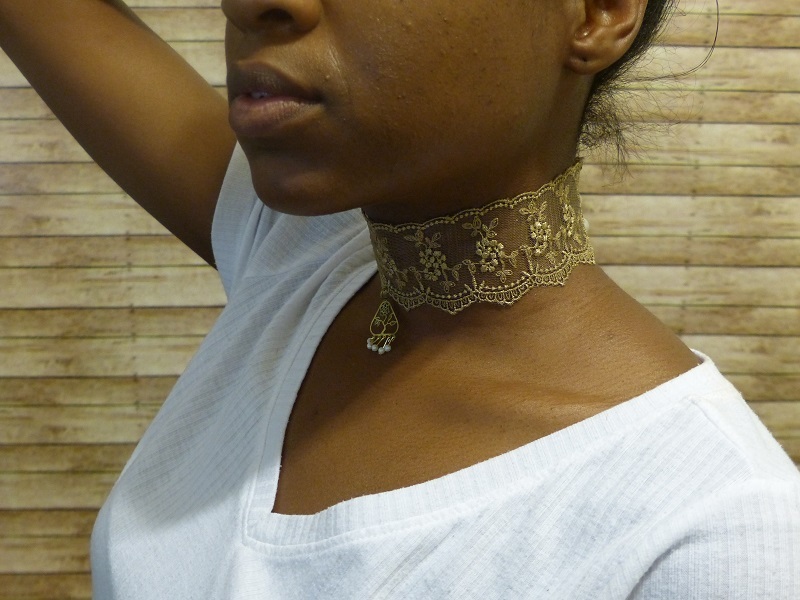 Well as we head into Fall and Winter, chokers are going to get more bold! That’s right! Big, Bolder, and more Gaudy, which makes it the perfect D.I.Y Project. These are tools you shouldn’t need to purchase if you have them lying around the house. Crafters equipment. With measuring tape, measure the circumference of your neck. To that circumference add about 1/4 a centimeter. This allows space for correcting errors. You’d rather your strip be too long than too short. You can cut off extra but you can’t add back if you cut too short. 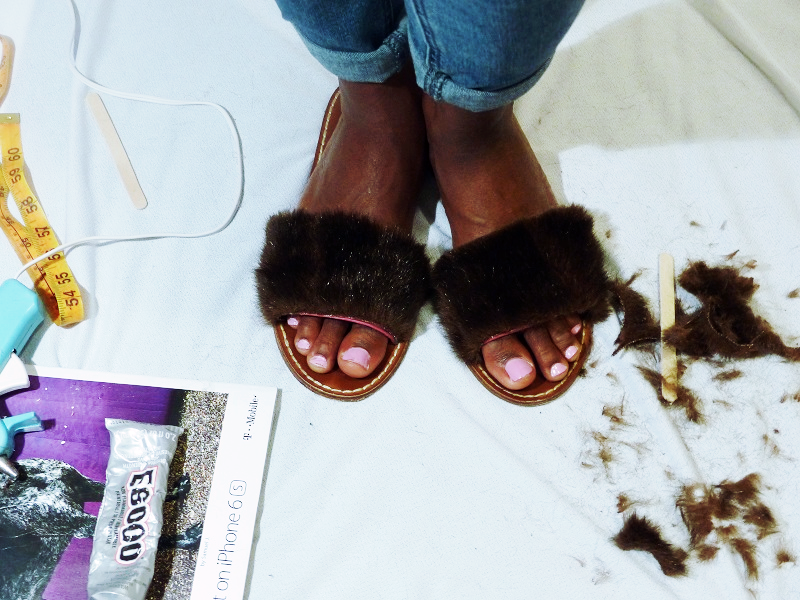 Cut your lace strip to the length that you measured. When applying your pendant. 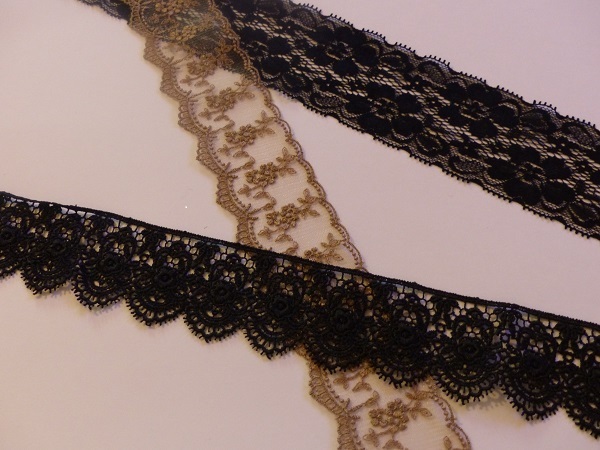 Measure to the center point of your lace strip. 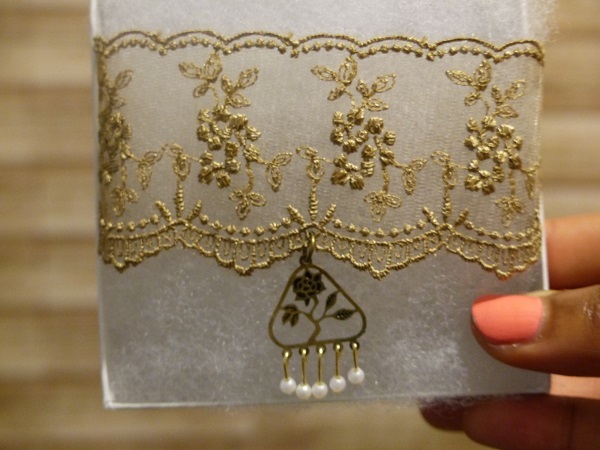 Open the jump ring on your pendant and insert it into an opening in the lace. Close the jump ring. 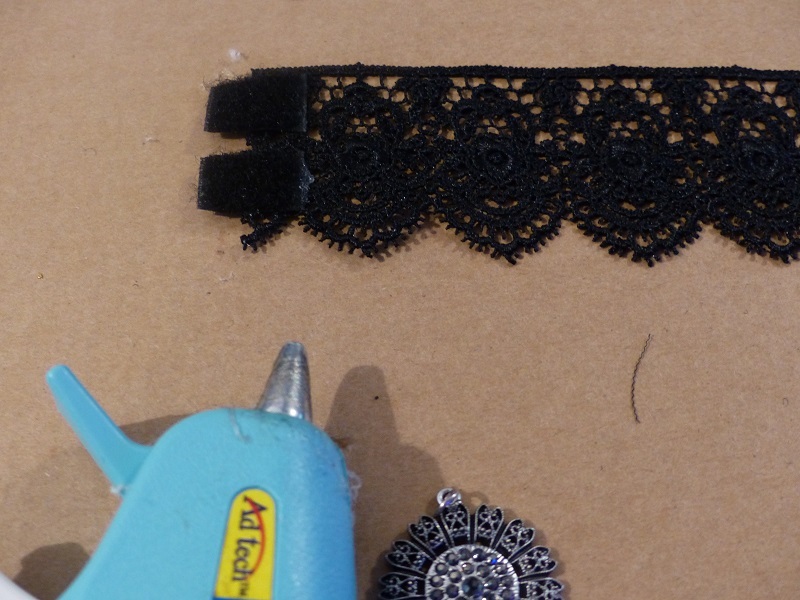 With your hot glue gun, glue thin strips of Velcro on to the ends of your lace strip. This will be how you put it on. 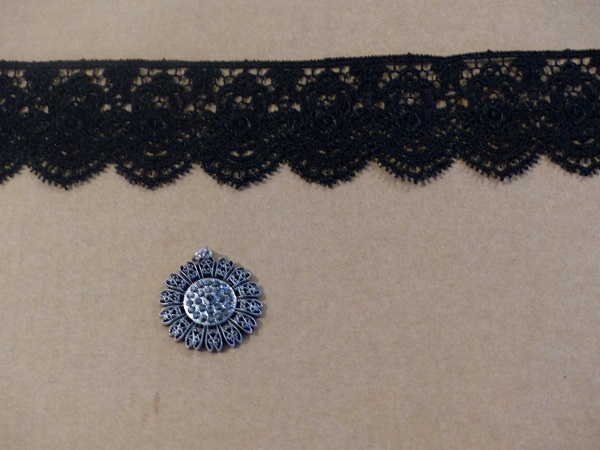 Double check before gluing the strips that they are on the right side of your choker and that it hasn’t twisted. These chokers make great gifts and are fun to personalize. You can purchase one if you are not into DIY. Click Here to visit my storefront! 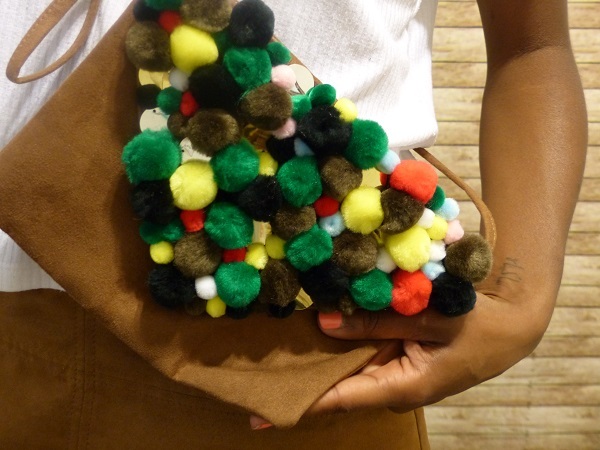 I had the idea for making this clutch because I walked past the pom pom isle in Hobby Lobby, and I thought wouldn’t be cool if….. you know the rest. Needless to say, I am very happy with the finished product. 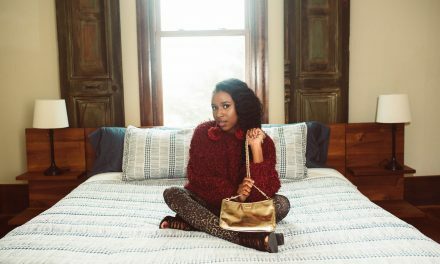 I anticipate wearing this bag/clutch on days when I’m wearing solid colors, dressed casual, or otherwise need a fun statement piece to keep my outfit from looking drab. You can buy the pompoms in any color you like. I tried to stick to Fall and Winter friendly colors, red, black, brown, dark green, with small pops of pastels and yellow. 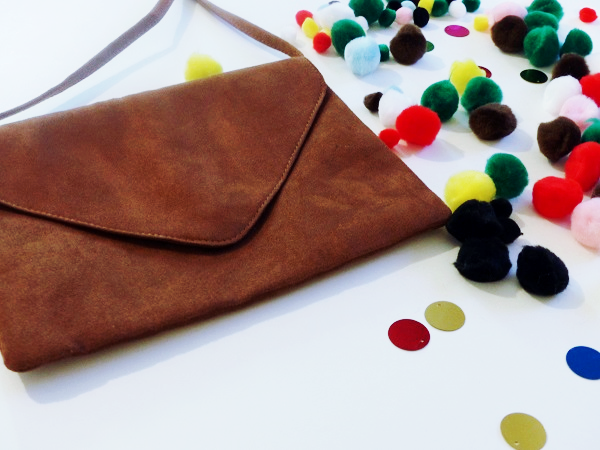 Statement Clutch = = $17 or less! 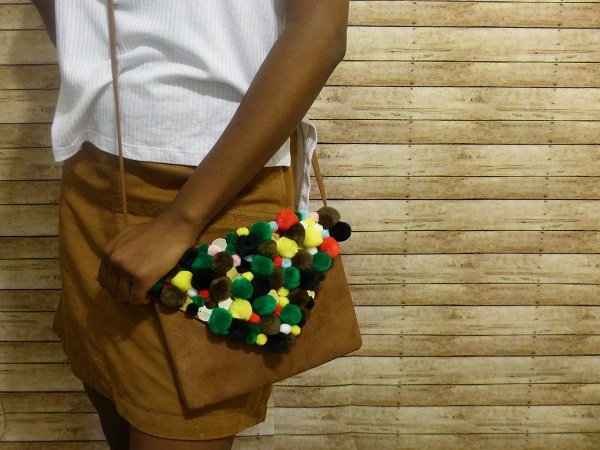 This bag is so simple to make because it requires your own personal creativity. There is no rhyme or reason to placing the pompoms. 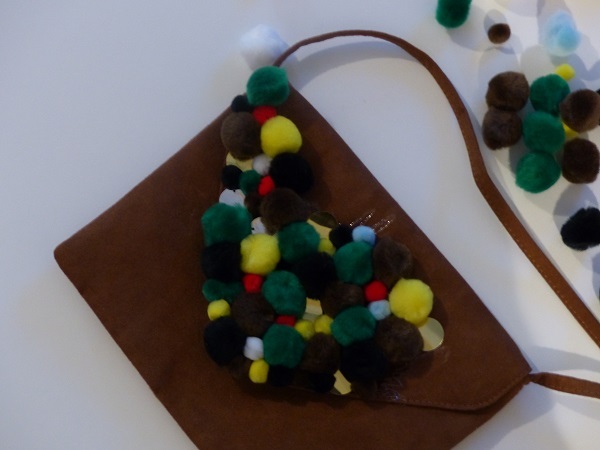 Some pointers though would be to keep an even distribution of small and medium pom poms. Also don’t use too many sequins. They melt with the hot glue so only use a small amount of glue. Glue the pom poms on the edges of the sequins to help secure them in place. Have fun with it and don’t overthink it! Ok, I know what you might be thinking. WTF? Yes, I will be rocking these babies all throughout Fall. I’ve had the idea for a while, and I’ve now brought it to life and I absolutely love them! They are quite elegant. And you can make your very own for under $20! Click the image above or here to watch m D.I.Y video for these ultra chic slip-ons. Yep I’m on YouTube Yall! Go Subscribe!! NextDo you even thrift bro?